We started cycling early and reach Cayo Lavisa in time for a great lunch. They served enough to feed our entire group at least four times over. We had lobster (delicious), two kinds of fish, rice and beans, and innumerable salads. Unfortunately, Lisa and Jennifer were sick all day and were unable to enjoy the day’s activities. En route to the lunch stop, I passed a small fruit stand and stopped to take a photo. The young woman proprietress came out and gave me a guava, which I promptly ate. Delicious. We chatted for a while, giving me another chance to practice my Spanish. When I asked if all the fruits were locally grown, she took me on a brief tour of her “farm” which looked more like an overgrown patch of brush. She showed me where several of the various fruits were growing, including some pineapples. After lunch we took the ferry to the island where we spent the afternoon on the beach. The 2pm ferry left promptly at 2:32 pm. The beach was fantastic, with very fine white sand, and the water was particularly inviting. The return ferry at 5pm was very crowded. We boarded the bus again for a long shuttle ride back to the hotel in Soroa where we had stayed the previous Sunday. Today is the last day of cycling. We start out with the opportunity to cycle up the back side of “the wall,” the challenging ride earlier in the week. All but two of us decided to pass up this opportunity and instead ride the shuttle to the top and start our ride from there. I vacillated but ended up taking the shuttle. Mike and David did the climb, and David said that it was actually easier than the front side. We have a new word to describe the balance of today’s ride – “downulating.” This made up word describes the rolling hills that we traverse on our long descent. It was lots of fun, and I stopped to photograph a group of fishermen pulling a net full of fish from a rather ugly looking pond – not sure that I would want to eat those fish. We ended the cycling in the small town of Cabaña and had a picnic lunch in the town square. We enjoyed it, except for the presence of an obnoxious beggar that would not take no for an answer. Cuban artist José Fuster’s art is “naïve,” meaning he uses childlike crude shapes and bright colors in his untrained composition. His work has been compared to that of Picasso, a comparison that followed him in successful gallery tours across Europe. After one such tour, Fuster was struck with a desire to recreate something like Gaudi’s public works in Barcelona and Brâncuși’s across Romania in his own homeland. He wanted to put his artistic reality into his real-world surroundings, and he began in his own neighborhood. 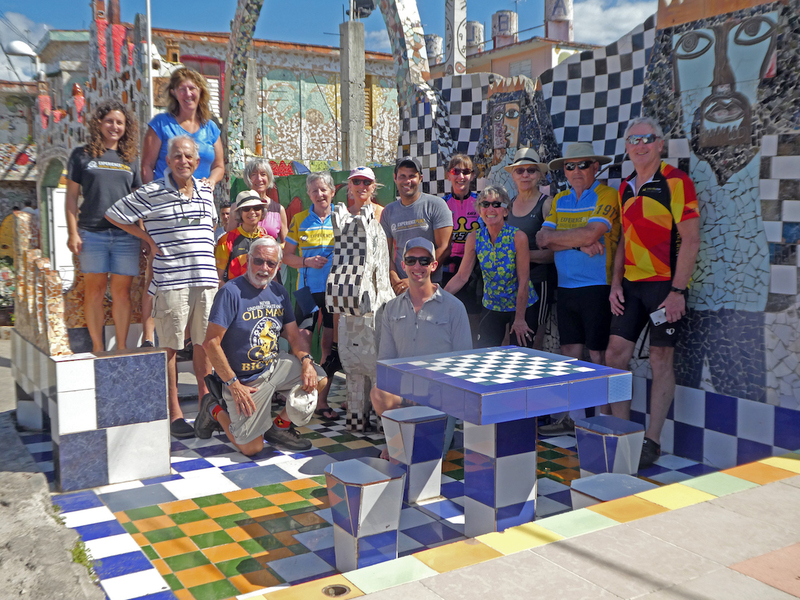 In 1975, after moving into a modest wood house in the rundown neighborhood of Jaimanitas outside Havana, Fuster set about decorating his studio in colorful mosaic. Once he was done there, he asked his neighbors if he could decorate their homes and business as well. A few accepted his offer and the tile creations grew. Over the course of a decade, doctors’ offices, bus stops, fountains, benches, gateways, and more were enveloped by Fuster’s whimsical imagination. Today, his artwork coats the neighborhood in a rainbow of strange, enchanting fantasy. Jaimanitas was an economically depressed area before Fuster arrived, and now it has turned into an artist’s paradise. Tourists are bussed into the neighborhood to admire Fuster’s still-growing kingdom, which has spawned a new generation of artists inspired by the surroundings they came up in. We reboard the bus which takes us to the Presidente hotel. The air-conditioning in my room is extremely loud, and they will not move me to a different room. The only option is to turn it off and open the window. Fortunately, we are only about two blocks from the harbor, and there is a pleasant cool breeze in the late afternoon and evening. Most of us return to the restaurant of a week ago (Restaurante Paladar Decameron -- where I had the disappointing shrimp). Tonight, I had octopus with pasta, and it was superb. Although we are in what appears to be a good neighborhood, the restaurant door remains locked and guests have to knock to be admitted. The day ended with a pleasant walk back to the hotel.